Win a 7-night stay at Reflect Cancun Resorts & Spas! Win a Seminar At Sea cruise for you and a guest! Win a 7-night stay at Excellence Oyster Bay! What’s Japan Got To Do With It? 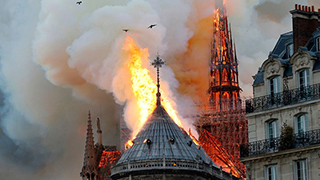 Air France and Air France-KLM have made a grand gesture in the wake of yesterday’s fire at the Notre-Dame cathedral in Paris. Benjamin Smith, CEO of Air France-KLM, along with Anne-Marie Couderc, chairman of Air France-KLM, and Anne Rigail, CEO of Air France, announced that Air France will provide free transport for all official partners involved in the reconstruction of the iconic structure. The Air France-KLM group says in the coming days it will set up a voluntary donations fund for its customers to help finance the reconstruction work. Thanks for commenting. Your comment is awaiting moderation. Once it is approved, it will appear on the site. Open Jaw, openjaw.com, fax board™, and faxboard.com are trademarks of Open Jaw Network Ltd.